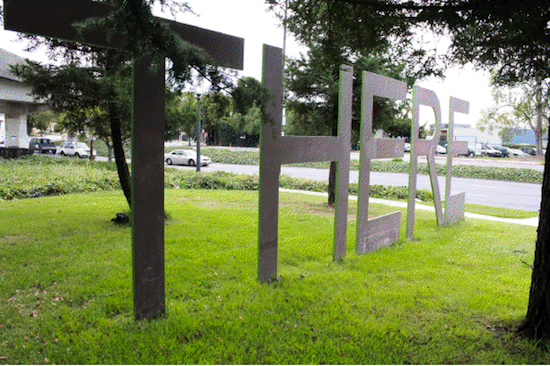 "There" statue at the Oakland/Berkeley border. Photo by Joe Sciarrillo. Ever since Gertrude Stein wrote of Oakland, "there is no there there," people have used this quote to condemn the city. But taking a closer look at the quote and the context in which it was written, we can see it is an expression of "painful nostalgia" and not of disdain or insult to Oakland. Let's take a closer look at this famous quote and how it relates to the artists interviewed in Oakland in Popular Memory putting a new "there" in Oakland. "...what was the use of my having come from Oakland it was not natural to have come from there yes write about it if I like or any- thing if I like but not there, there is no there there." Stein's family moved to Oakland in 1880, when she was six. Her family lived in a home near today's 13th Avenue and East 25th Street. She lived in Oakland until 1891, and left at age 17 for Baltimore, after her parents passed away. Oakland was a much smaller town then, with a population of just under 35,000 in 1880. Nearly 45 years later, Stein returned to Oakland on a lecture tour in 1935. By that time, the city had grown nearly 10 times to over 300,000 residents. When she tried to find her childhood home, it was no longer there. When she published Everybody's Autobiography two years later, saying there was "no there there," it was written to reflect painful nostalgia about her home being gone and the land around it being completely changed. The house where she grew up was on a sprawling 10-acre plot surrounded by orchards and farms. By 1935, it had been replaced by dozens of houses. Oakland held a special significance to her, and on her return, she found that Oakland had urbanized and changed from the pastoral place she remembered. Gertrude Stein writes in her autobiographical novel, The Making of Americans, about her childhood in Oakland, where a child "could have all anybody could want of joyous sweating, of rain and wind, of hunting, of cows and dogs and horses, of chopping wood, of making hay, of dreaming, of lying in a hollow all warm with the sun shining while the wind was howling." Returning to her home decades later to find it gone and to find Oakland no longer a place "of chopping wood, of making hay" struck her, and she wrote her famous "no there there" quote in response. This makes me wonder if one of the artists interviewed in Oakland in Popular Memory were to return to Oakland 40 years from now, would they recognize the city? One theme in the interviews was a notion of disenfranchisement similar to what Stein experienced by returning to a changed city. People are getting pushed out of Oakland at an alarming rate. African Americans made up nearly 50 percent of the city when I was born in 1984, and that number has dropped to only 27 percent today. There were 33,000 fewer African Americans living in Oakland in 2010 than there were in 2000. Like Stein returning to Oakland to find it completely changed, would an artist interviewed in this book experience a similar feeling returning to Oakland 40 years from now? When researching Gertrude Stein at the Oakland History Room, the literary portrait file had photos of Jack London, a contemporary of Stein's, who also grew up in Oakland. The file included other famous authors who visited Oakland in the late 1800s, including Mark Twain, Robert Louis Stevenson, and John Muir. Despite the misinterpretation of Stein's quote, there has always been a "there" in Oakland. Oakland has been blessed with several waves of artistic movements, stretching back to these authors. And in interviewing innovative artists and writers in Oakland today for Oakland in Popular Memory, I've seen first-hand that now, more than ever, there is a "there" in Oakland.